Update (07/25/2018): The larger networks have pushed out Android Oreo to Galaxy S7 and S7 Edge users. You’d think that unlocked devices would be ahead of carrier versions, but that’s not the case here. Owners of unlocked Galaxy S7 and S7 Edge devices in the U.S. are only reporting the update now. According to r/GalaxyS7 (via Android Police), the update weighs in at 1481MB and carries the build number R16NW.G930UUEU4CRG2. The update doesn’t have the latest security update (it tops out at April 2018), but users can expect notification channels, autofill APIs, and battery life enhancements, for starters. Have you received Android Oreo on your U.S. unlocked device? Let us know in the comments section! Original article: Welcome to the Samsung Galaxy S7 and Samsung Galaxy S7 Edge Android update tracker page. This page covers all major U.S. carriers with a quick reference table for each and a log with links to further details. It will be regularly updated with the latest Galaxy S7 and S7 Edge update information. The Galaxy S7 and S7 Edge tend to receive their updates simultaneously – or at least very close together. For this reason, they both appear here on this update page. Also, note that we won’t be covering general security patches in our list, unless they include something particularly relevant. We recommend you bookmark this page so you can stay up to date with the very latest updates. Both the Galaxy S7 and Galaxy S7 Edge are now receiving Android Oreo. Verizon, AT&T, Sprint, and T-Mobile have started rolling out Android Oreo to the Galaxy S7 and S7 Edge. Unlocked devices in the U.S. haven’t received the update yet, either. 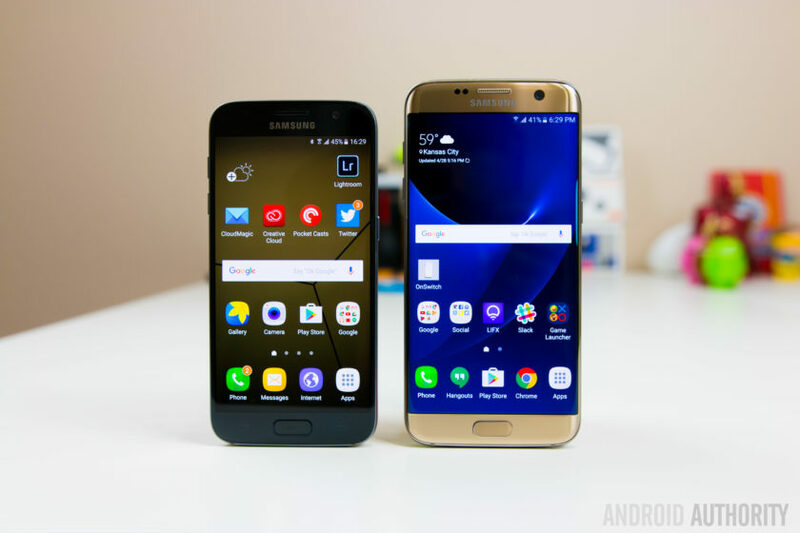 Galaxy S7 and S7 Edge Update U.S.
June 12, 2018, After removing the previously announced Oreo update, Big Red has started rolling out the Android 8.0 update to Galaxy S7 and S7 Edge devices. June 7, 2018, Verizon removes previously-announced Oreo updates. June 6, 2018, The network launches the Oreo update to its subscribers, complete with April 2018 security update. April 20, 2018, Verizon rolls out OTA that claims to be Android 8.0 Oreo but isn’t. Oops. November 23, 2017, Verizon rolled out an OTA update with build number G930VVRU4BQK2. The new version introduced the November Android security update, including a patch for the recent KRACK exploit. March 6, 2017, Verizon became the last of the four major US carriers to roll out Nougat to the S7 and S7 Edge. September 1, 2016, improved voice calls, FM Radio, Barcode Beaming functionality and NextRadio app added. May 9, 2016, DT Ignite added. Helps Verizon package and install apps on devices. Can’t be removed without root. June 8, 2018, a user on Reddit posted screenshots of a Galaxy S7 receiving an Android 8.0 Oreo update from AT&T. December 13, 2017, AT&T is rolling out an update with build number G930AUCU4BQK2 (G935AUCU4BQK2 for S7 Edge). The OTA update includes the November Android security updates, support for new Mobile Hotspot APN, an AirWatch fix for Enterprise customers, call performance improvements, and network performance improvements. July 11, 2017, AT&T provides fixes for calendar and messaging apps, as well as the Samsung Knox security software. Video calling has also been improved. February 18, 2017, AT&T began the Nougat update roll out for the S7 and S7 Edge. July 27, 2016, Wi-Fi calling arrives. April 21, 2016, DTV Widget added, better Wi-Fi performance when using BTLE, home and volume key responsiveness improved, other performance enhancements arrive. June 29, 2018, T-Mobile rolls out Android Oreo to the Galaxy S7 and S7 Edge, weighing in at 1746MB. February 17, 2017, T-Mobile became the first U.S. carrier to roll out Nougat for the S7 and S7 Edge. November 5, 2016, enabled 256/64 QAM, domestic data roaming improvements, system crash fix. May 4, 2016, FM Radio, power and volume key fix, system improvements. June 19, 2018, Sprint users report that the Android Oreo update is rolling out to Galaxy S7 and S7 Edge users. February 21, 2017, Sprint started rolling out the final Nougat build to its S7 and S7 Edge beta testers. The OTA rollout to non-beta users is expected soon after and to conclude on February 27. May 26, 2016, battery life improvements, Wi-Fi calling added. May 18, 2018: Samsung resumes the Oreo update rollout for the Galaxy S7 and S7 Edge. May 16, 2018: Samsung pauses the Oreo update due to bootloops in several cases. March 30, 2018: Oreo began to roll out to Samsung Galaxy S7 devices in the UK. March 12, 2018: Samsung Canada announced that the Galaxy S7 and S7 Edge would begin receiving their Android Oreo updates this summer. March 20, 2017: Nougat arrived to Rogers and Telus in Canada. January 17, 2017: Nougat became available for all international unlocked Galaxy S7 and S7 Edges. January 12, 2017: Samsung rolled out Nougat for international unlocked devices enrolled in the beta program. January 4, 2017: Samsung began a limited soak test for the unlocked S7 and S7 Edge. December 21, 2016: Vodafone Australia confirmed that the Nougat version they’re testing for the Galaxy S7 and S7 Edge is Android 7.0, not Android 7.1. December 20, 2016: The fourth major beta update has rolled out to the Galaxy S7 and S7 Edge for those enrolled in the Galaxy Beta Program. The update removes the Samsung Notes app and a previous mention of the Samsung Experience interface. December 16, 2016, Vodafone Australia lists the Galaxy S7 and S7 Edge in its weekly software update wrap-up. States “testing in progress,” but doesn’t provide an ETA.